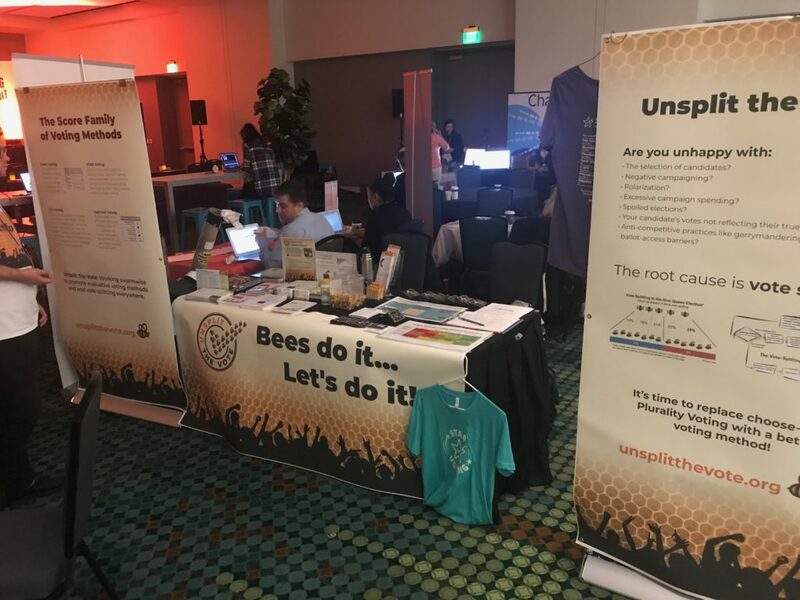 Unsplit the Vote was a sponsor at the 2019 Unrig Summit in Nashville, 29-31 March. We had a table, our first full conference presence, and shared it with the like-minded Equal Vote. Blake and Alan drove out from Denver, Paul came from Maryland, and a half dozen Equal Vote activists flew out from Oregon. RepresentUs, the conference organizer, expected more than 1500 attendees. 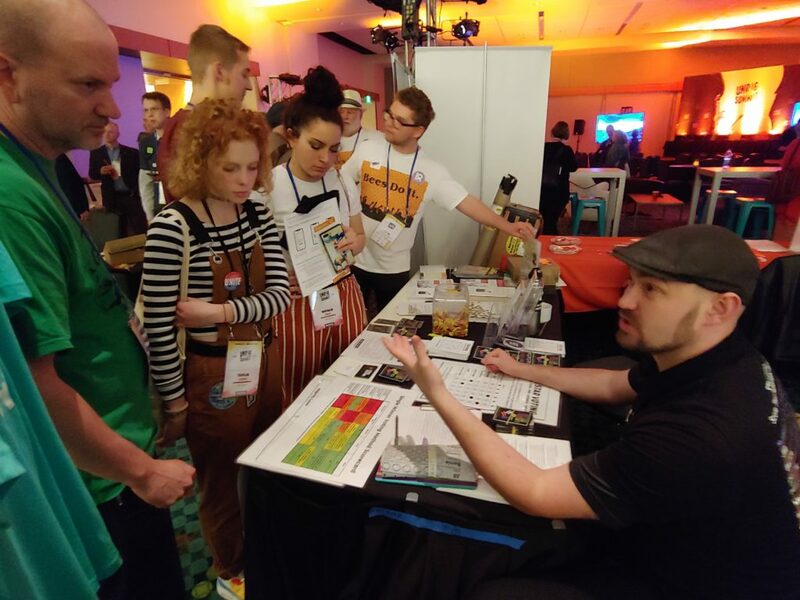 The Summit’s target problem was government corruption, and every exhibitor was promoting a different cause and solution. Unsplit the Vote made its case clear: the root cause is vote splitting in our elections, and the solution is an evaluative voting method, one of the Score Voting family. That message seemed to resonate, and people liked our honeybee motif (after some initial puzzled queries). One area for UTV to improve is literature and presentation aids with less text and larger pictures. Our Twitter raffle failed to generate buzz—surprisingly few Unrig visitors used Twitter. Summit participants were largely focused on the presentations and workshops, less on the exhibitors. The best networking occurred when our people went roaming, not remaining behind the table, though someone always had to be there. 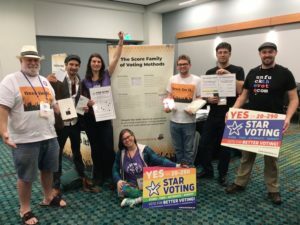 With UTV and EV sharing a table we got quality time with each other, but also hung out with activists from The Center for Election Science and even FairVote, which promotes the ranked voting method Instant Runoff Voting. In one extraordinary moment, the combined UTV-EV team sang the STAR Voting theme song. This was captured on video but is mercifully omitted here; it is enough to know that it happened. 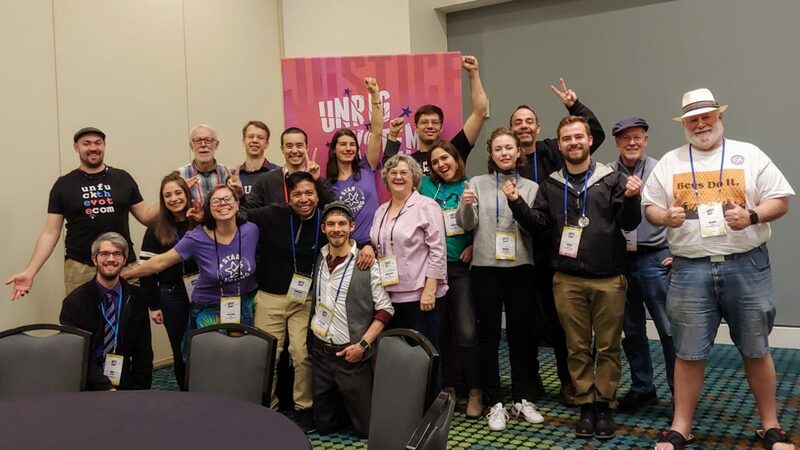 Judging by the number of voting-reform groups at Unrig, there appears to be a growing consensus that our current voting method is the root cause of today’s political troubles. There is less consensus about what voting method is best–each organization seems convinced that its preferred method is the platonic ideal–but everyone agrees that choose-one Plurality Voting is dysfunctional. Fortunately the USA is sufficiently decentralized that there is room for experimentation, and we reformers will have more success if we cooperate.